Kolkata, a city that means many things to many people. For some, Kolkata is the city of joy, while for others it is dirty, crowded,and noisy. Once the greatest colonial city in the Orient, Kolkata was later reviled as a cauldron of poverty, dirt, and disease. Today, it ranks among the four major metropolis of India along with Delhi, Mumbai, and Chennai. The metropolitan city of Kolkata in the eastern Indian state of West Bengal extends between the latitude 22°82' N and longitude 88°20' E. The city is well connected to the other cities of India through train, bus, and air services. Most of the countries in the Asia have flight links to the city. As Kolkata is near to the sea, the city has uniform temperature throughout the year. The temperature ranges from 1227°C in the winter and 2438°C in the summer. Annual rainfall is around 160 cm. Humidity level can be very high in the summers and can make ones life difficult. A mere village in the 17th century, Kolkata is not an ancient city like Delhi. Like Mumbai and Chennai, it originated largely due to the expansionist ambitions of the European powers, especially the British Raj. Little wonder, Kolkata has some of the finest Raj edifices built in a variety of styles. 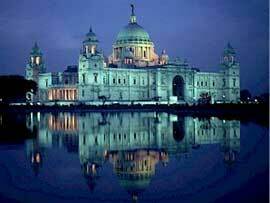 Kolkata remained the capital of the British government in India. Being the center of power for so long created a unique culture and heritage of the city, totally unlike any other city of India. The people here are proud of their culture and can go to any length to defend it. The humanity of the city can be felt only through visiting the place and not by reading. Victoria Memorial is a huge white-marble structure and the most enduring of remains of the British Raj in India. The structure, which is now floodlit in the night, gives a fascinating site. It has been now converted in a museum that houses the most impressive collection of memorabilias from the days of Raj. Indian Museum, built in 1874, has a beautiful structure. The oldest museum in India. The entrance to the museum houses an original Lion Capitol, the national symbol of India. The museum is opened all days of the week except Monday. The normal timing is 10 a.m. to 5 p.m.
Fort William was constructed in 1781 after the unfortunate happenings of 1756 in which many British soldiers with their families were killed by Siraj-Ud-Daula. Large area around the village of Govindpur was cleared off the forests and this fort was constructed, which for some time also lent its name to the city. The area around the fort is a very large patch of green known as the Maidan (ground). The Maidan is also known as the lung of Kolkata and stretches 1 km in width and 3 km in length. Belur Math, the headquarters of Ramakrishna Mission, is situated in the north of the city. The place was founded in 1899 and houses a structure that was designed to be a church, temple,and mosque all in one. Other important sites that can be visited are Dakshineshwar Kali Temple, Botanical Garden, Marble Palace, Tagore House, Church of St John, Nakhoda Mosque, Raj Bhawan, Town Hall, and St. Pauls Cathedral. The most popular place to visit around Kolkata is Shanti Niketan. Situated 136 km northwest of the city, this is the place where Rabindranath Tagore lived and established a university. Bishnupur, 100 km northwest of Kolkata, is yet another exciting and hitherto unexplored holiday destination. Bishnupur houses unique terracotta temples, each more beautifully embellished than the other. Bishnupur is renowned for its crafts such as intricate Balucheri saris, the rare ganijifa (circular Indian playing card), delicate carving on shells and bell metal artifacts. Chandernagar (35 km) is the former French settlement that still abounds in buildings from that period of history. The important places to visit are the Quai Dupleix, Eglise Du Sacre,and image of Joan of Arc. To know and understand Kolkata in its eternity, one is invited to the city during Durga Puja - a time when Kolkata becomes unforgettable. Every year, for four days, Kolkata forgets its worries and yields to a paroxysm of celebration and worship. This is a special occasion because of the transcendent place Goddess Durga holds in the Bengali imagination. Kolkata Book Fair is the largest in Asia and provides ample opportunities to the bibliophiles to explore the fascinating world of books. The event is held every year in the month of January or February. Kolkata can be described as a shopping paradise for them who really want to get value for their money. Every market, which has a crowded and dusty look, has its own history and specializes in something exotic and unique. New Market, Kolkata's oldest and most renowned municipal market, offers one of the widest ranges of goods. Recently, a new complex has been added on Bertram Street to house the partially burntout section of the market. The market offers leather goods, plastic toys, fancy silverware, jewellery, garments, fabric, confectionery, clothing, dry fruits, poultry products, fish, meat, flowers etc. The air-conditioned market at Shakespeare Sarani specializes in clothes, novelties, artificial plants, jewelry, electronic household gadgets, watches, etc. For plastic toys, stationary, firecrackers, diaries, electrical goods and appliances, and glassware, one can visit Bagri Market. Bowbazar at B. B. Ganguly Street can be searched for wooden furniture and musical instruments. The best place to go for second-hand products is Chandni Market. China Bazaar is famous for its paper buntings, streamers, and other domestic goods. College Street is the best place to bargain for books. For imported goods, one can check out Five Star and Fancy Market. Dakshinapan Market houses most of the government emporia. The place is well known for its handlooms, textiles, handicrafts, cosmetic jewelry, fancy goods, object d'art, etc. For flowers, one can have a look on the Lake Market at Rash Behari Avenue. Kolkata is connected with most of the Indian cities by road. The Esplanade Terminus in the heart of the city is the main bus terminus. Most of the domestic airlines have direct services to and from Kolkata to other important cities of India such as Delhi, Mumbai, Chennai, Patna, Varanasi, Lucknow, etc. Kolkata provides direct flights to most of the countries in the Southeast Asia. The airport in Kolkata is situated at Dumdum, around 17 km northeast of the city center. Trains from the other parts of the country connect Kolkata. The city has two major railway stations - one at Howrah and the other at Sealdah.